One of the small but useful features of the next release of SunWikis, due some time next week, will be support for Open Search descriptors. 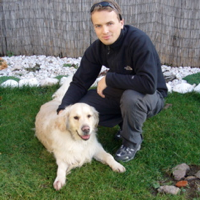 Open Search descriptors (OSD) help browsers (and other clients) to discover ways to search content of a website. If you go to a site that supports OSD and you are using an Open Search enabled browser, the browser will notify you about the possibility of adding the current site's search among the browser's search plugins (Firefox does this by glowing the down arrow in the search box). 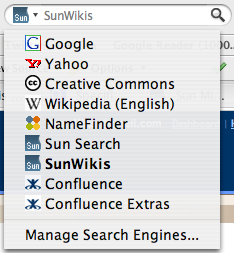 Once the search plugin is installed, you can search SunWikis directly from your browser's search box. While I was at it, I created this descriptor for Confluence documentation located in the DOC wiki space at confluence.atlassian.com and a second descriptor that searches the DOC, DISC (Confluence Community), and CONFEXT (Confluence Extensions) wiki spaces at the same time. 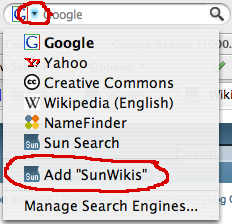 Warning: As for SunWikis, you can install the search plugin now, but once the next SunWikis release is out, you should probably reinstall it just in case we tweak and enhance it. Who knows, maybe Atlassian will use my code and officially support these search descriptors on their site - they have my full support. As for technical details, I plan to write wrote another entry just about how I created and added these descriptors to Confluence. 3 Due to limitations of the Sherlock format, it is not possible to craft a "click-to-install" file for the 3rd plugin, however you can still install it using the alternative2 installation method.